We all like to get “up close and personal” with our favorite authors, learning more about them and why they do what they do. This blog is a part of a virtual blog tour that is giving us the opportunity to do just that with people we know, and introducing us to people we might want to know. I was invited to participate in this tour by author and publishing CEO Terri Ann Leidich. I met Terri through Shari Stauch of Where Writers Win and was thrilled when her publishing company, BQB Publishing, accepted my manuscript for Ameera Unveiled. We’ve shared our love of words ever since. Terri isn’t just a publisher, though. She’s the author of three books: From a Grieving Mother’s Heart, For a Grieving Heart, and her debut novel, Family Inheritance, which will release in October, 2014. Terri lives in Christiansburg, Virginia with her husband and foodie, Glenn. I enjoyed sharing a bbq lunch with them after the Pubsmart Conference. I not only count Terri as a highly skilled and talented publisher, but someone that rejoices in my writing triumphs and helps me over speed bumps. a) What am I working on? Ameera Unveiled is launched and marketing takes a piece of my time. However, I’m now working to write a novel based on the lives of the adorable men of the Old Navy. My childhood was guided and molded by the global struggles, starting with the Cold War, in which my father(s) were Tin Can Sailors. Beside my own lifetime experiences as a Navy dependent, I’ve been embraced by many military veterans and entrusted with their memories. The confessions of Tin Can Sailors fill note cards scattered around my writing room. Hopefully, I can weave a tale that preserves a period of time with less technology but a complicated simplicity. But, like Terri said in her post, I need to focus on capturing a second story. I’ll continue to absorb their stories, educate myself on historical facts as I attempt to create characters. Characters that hopefully represent a National Treasure– our Tin Can Sailors. b) How does my work differ from others of its genre? 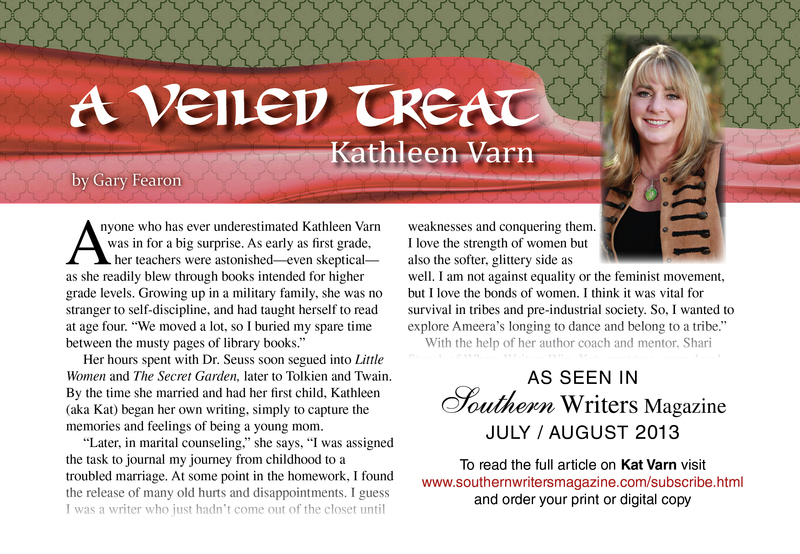 I don’t feel worthy to compare myself to veteran authors of women’s fiction. My writing perspective tends to remain on challenging my writing style. I love to use humor in the face of personal growth. But, at the same time, I like to untangle facing the unknown with all the complications of being human. And that’s not limited to the genre of women’s fiction. Of course, my voice tends to reflect being part of the Baby Boomer era and personal spirituality. Each phase of my childhood did have a dose of innocence and naivete that is not as common for the past few generations. I tend to promote a moral compass and leave some subjects sacred. So, I guess I may be a bit of a dying romantic? c) Why do I write what I do? I love to observe people and the serendipity aspects to reaching one’s destiny. I am a fan of revealing the internal depths of my characters. I grew up surrounded by adults that were resilient in the face of hardships. Hardships that spanned disruptions in our economy to global aggression. I’d like to preserve the pride of generations to work and aspire to accomplish dreams. My childhood was filled with a freedom to roam neighborhoods, play kick ball in the street and explore undeveloped woodlands. I want to preserve the memory and experience from a less technically advanced world. Let’s still talk on the front porch, not from a text on a cell phone! d) How does my writing process work? I am blessed to have a writing coach, Shari Stauch, who never lets me get away with being too soft or frozen. However, my personality tends to love spontaneity rather than rigid outlines and schedules. I have a strong sixth sense for personal movement. So, if I’m pushed to research, interview and observe– I know it is going to pay off. As Terri Leidich says, “It’s a marathon, not a sprint.” Once I leave the starting gate, it seems to flow and develop page by page! Attempting to create Ameera Unveiled, I was encouraged to turn off my editor and just write. So, I did. Little did I know that we would cut and paste so many times when it was accepted by BQB Publishing. I loved my main character for a while– until I had edited with the whole crew that gets you to the finishing line. I was about to ask for a divorce! Or smack her around a bit and demand that she quit whining! But, the joy for me to share the deep and strong bonds of healthy women was worth it. Thanks for the visit– feel free to ring the door bell and visit on the porch next time! Now, here are my blogger/author, recommendations – Enjoy! I had the privilege to meet Catherine at an intimate book reading at a mutual friend’s home in Charleston, SC. 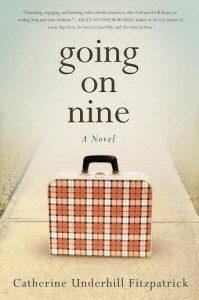 She took us behind the scenes of her newest novel, Going on Nine. I resonated with so many of her memories. I purchased and devoured her book. Catherine Underhill Fitzpatrick grew up in suburban St. Louis, the second of six children who ― like the heroine of Going on Nine― meandered through sultry summers unscheduled and unfettered. After graduating from the University Of Missouri School Of Journalism, she worked as a staff feature writer in Hannibal, St. Louis, and Milwaukee. In September of 2001, Catherine was in Manhattan to cover New York Fashion Week for Wisconsin’s largest newspaper. At first word of the terrorist attacks, she rushed to Ground Zero and filed award-winning eyewitness reports. An account of her reportage that day is included with accounts of other reporters and photographers in Running Toward Danger (2002, Rowman & Littlefield). A front page of the newspaper edition containing one of her 9/11 dispatches is among those memorialized in Washington D.C.’s Newseum. Her book-length account of her harrowing experiences that week has been accessioned into the State Historical Society of Missouri archives. 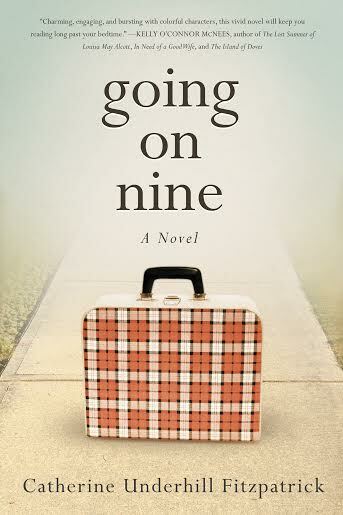 Going on Nine (Familius, 2014), a coming-of-age story set in 1956, is Catherine’s second novel set in St. Louis. A Matter of Happenstance (Plain View Press, 2010), her debut novel, is a four-generation family saga that explores the power of personal character over coincidence. Catherine is a board member of the Chicago-area TallGrass Writers Guild. She and her husband, Dennis, have two grown daughters in Chicago. She and her husband live in Glenview, IL, and Bonita Springs, FL. I was introduced to Deb at her book signing at a Charleston Barnes & Noble. Later, we bumped into each other and forged a deeper personal connection at the Pubsmart Writing Conference in Charleston, SC this past spring. She is a delightful and witty woman I look forward to running into or intentionally spending time with. 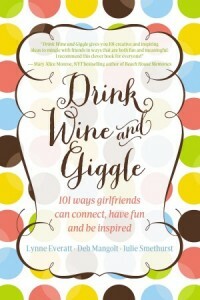 She co-authored a girlfriend oriented platform book called Drink Wine and Giggle. I’m all about wine-ing! 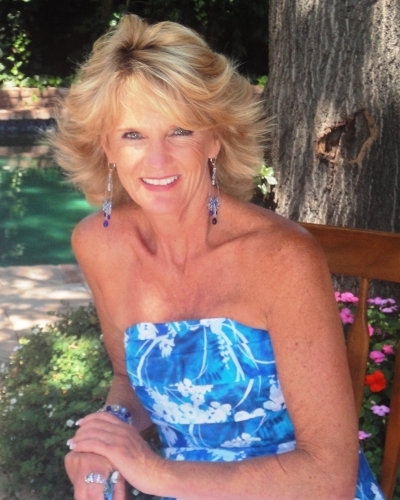 As an Event Planner and Certified Professional Coach, Deb brings her positive attitude and bubbly personality to turn family reunions, corporate team-building events and women’s retreats into memorable and intoxicating experiences that demonstrate the power of true compassion. Deb’s former career in corporate finance has taken her across North America from Ohio to Tennessee to Toronto and finally to Charleston, South Carolina where she resides with her husband. A devoted hospice volunteer, member of the Charleston Center for Women, and an avid golfer and runner, Deb completed the Kiawah Island Marathon in less than five hours. I met Jackie attending the Faulkner Words and Music Festival in New Orleans, LA in 2010. While in the infant stages of writing Ameera Unveiled, I was extremely moved by a situation while on vacation in Florence, Italy. I felt driven to preserve it and forwarded it to Shari Stauch. She pushed me to polish it and submit in the essay competition– it short listed. Needless to say, she pushed me to attend the conference that Fall… and I met Jackie. What a beautiful and resilient woman! I don’t get as much personal contact with her as I would like, but was thrilled to hug her at the Pubsmart Conference this past Spring. Jackie Madden Haugh is a true native of California. Born in San Francisco, on December 31, 1952, to the son of Irish, Catholic immigrants, who fled the potato famine in the late 1800′s, and the daughter of silent movie actors, circa 1915 in Hollywood. Sandwiched between three boisterous brothers, life for Jackie in her youth was anything but calm and trying to have a voice amidst the rampant testosterone and alpha-male posturing was an impossible feat for her. With the gift of a small six-by-six diary on her tenth birthday, Jackie discovered the joy of journaling. Hiding in her room, pouring her heart and soul out on the blank pages not only gave her solace, but a friend who would listen to her thoughts, dreams and desires without any judgment.For the next forty-five years, she continued writing and in April, 2009, she self-published her first memoir, “My Life in a Tutu.” It started as a simple gift for her children, but instead morphed into something much larger. Word got out about this project in her small suburban town of Los Altos, California and to date she has sold several hundred copies there alone. Jackie still resides in the loving home where she raised her four adult children. 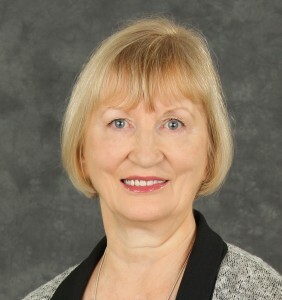 She continues to work in her career as a real estate agent, but devotes her spare time to her writing and her love of teaching dance to children. 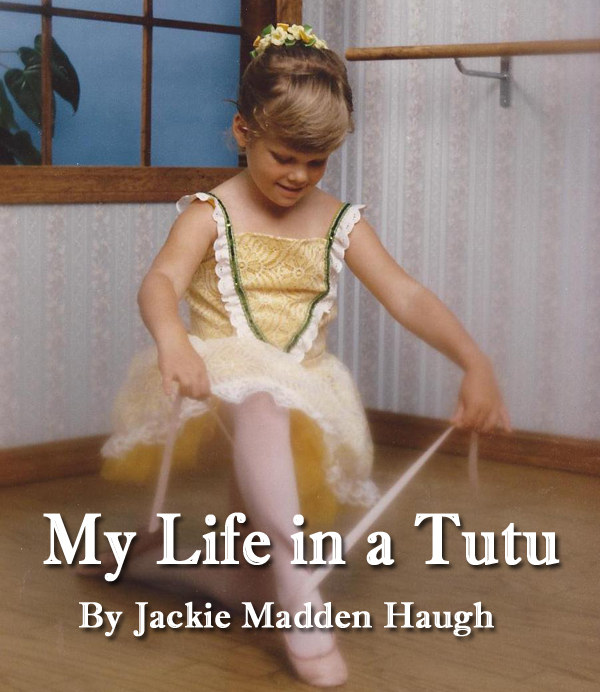 Currently, she is working on her next project in her series of memoirs, “Tipsy in a Tutu.” It is the hilarious story of friendship between three single woman in a world of married people.